HOLLAND GROVE VIEW. SEMI-DETACHED. 4+2 with basement. 3600 sq.ft. Quality finishes. Quiet. 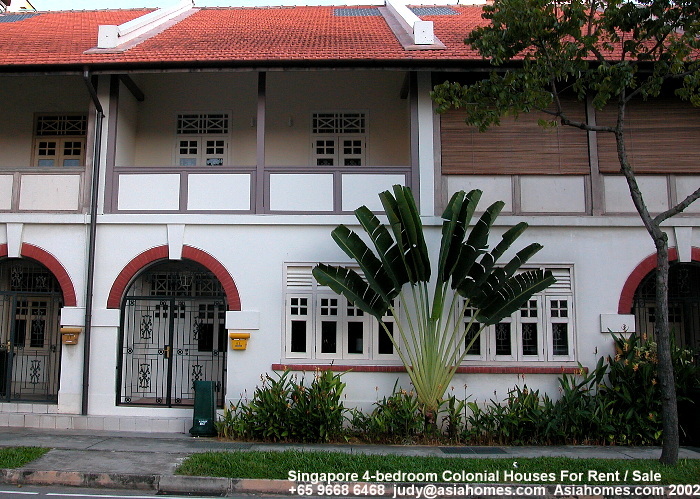 HOLLAND GROVE VIEW 3-storey SEMI-DETACHED with basement 2500/ 4200 sq.ft. 4+2 beautifully renovated. Quiet. Cul-de-sac. Many children, mainly Caucasians, of less than 5 years old socialise at 5 p.m at the exclusive park near a jogging track. Holland Grove View, Drive, Walk. 113 units, 2-storeys with huge basement. Majority are semi-detached. White with grey streaked marble flooring and wooden floor boards in bedrooms. A big family area on level 2. Two bedrooms on level 3 have attached bath. 291-385 sq. m (built-in area) & 200-450 sq. m (land area). 489-626 sq. m (built-in) & 489-1075 sq. m (land area). Small plunge pool in detached only. Some units don't have a separate maid's room and bathroom near the utility area. A description is reported below of the unit 2 for rent. Beautifully furnished with wooden cabinets in basement to enjoy your stereo. In the basement, some owners partition one end to be a maid's room as the two other rooms are very small. One is said to be a wine cellar and the other a maid's room. Family area on 2nd level for children to watch TV while you have privacy downstairs with guests. Family room on left and 2 bedrooms in level 2. Note the good sized balcony off the second floor master bedroom from the two semi-detached. Not all houses have balconies. Walk in closet, shower stall and triangular jacuzzi bath in master bathroom on 3rd level. Another bedroom on level 3. Other 3 bedrooms have built in study tables with similar green tree views. A big balcony off the master bedroom. Views of the jogging track from side. A bridge across a canal brings residents to the jogging track. A small maid's room at the basement room sufficient for a bed and a cupboard. Wet and dry kitchens. A long driveway to park 8 cars for bigger units. Usually residents park outside and gain a bigger area for the kids to play on the car porch. 2 parks with sand pits. Lots of young expatriate and Caucasian children. Meeting usually at 5 p.m. Tranquil. Little outside car pass through traffic. 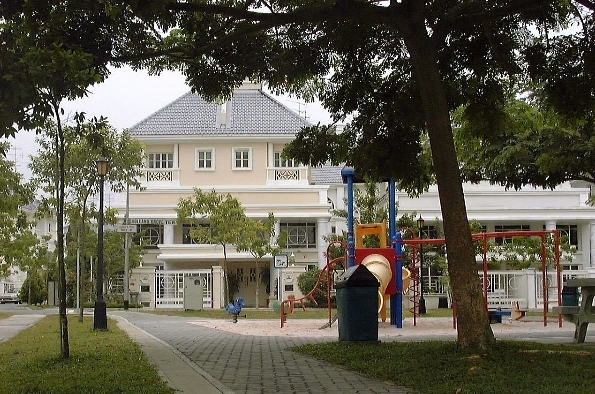 Near jogging and cycling track and a 10-min bus ride to the United World College and other international schools. Cycling distance to the Australian School. Large basement. Some units have a maid's room next to the utility area. Others partition the end part of the basement to make a maid's room. There are at least 2 store rooms in the basement (used as a wine cellar and a maid's or store room). A 10-15-min walk to the main road. However there are buses to the Bouna Vista subway in a 3-minute ride. July 24, 2000 House-hunting for bungalows at $7,000 is tough as there are almost none available at less than $10,000 in expat favoured districts 9, 10, 11 and 21. Wants a bungalow near the Australian School. House in Australia was 4,000 sq. ft built in and had a big swimming pool. However, it is extremely difficult to find one for $7,000. Needs 4 bedrooms as daughter and son have own rooms. One for guest. One for parents. 5+1 9,600 sq. ft land/4.200 sq. ft built in. $8,500. Old kitchen. Parquet flooring, big balcony and patio. Big terrace outside master bedroom on 2nd floor. 3 big bedrooms upstairs, 2 downstairs. Lots of ground. Breezy. Huge above-ground pool and badminton court. Suits expats with children less than 10 years old and budget below $10,000. A hot Caucasian enclave where houses are usually above 10,000 sq. ft of land. 6+1 10,000 sq. ft land/6,000 sq. ft $8,500. Modern marble flooring, large courtyard, little grass patch. A volley ball court. Huge separate living and dining area. 3 bathrooms with attached bathrooms. Master has a huge private terrace. A long green fence fronts the living and study room as the access area is common to the neighbour. Suits expats who want big area and not mind loss of privacy via common access road. Modern bungalow with pool. Remodeled with brand new kitchen and bathrooms. Side swimming pool is above ground. Did not give the feeling that it was on 10,000 sq. ft of land. 4+1 2,600/2,800 sq. ft $7,000. Small patch of grass characteristic of newer semi-detached. Did not impress but this location is very popular with Caucasian expats. Marble flooring and new baths and kitchen cabinets. Open concept kitchen. Pool just across the lawn. Short of the 4th bedroom. Original condition of 15 years. Will be difficult to get a tenant. The edges of the dual sinks in the master bedroom has been crudely filled with white silicon. Holland Grove View 5+1 2,200/3,700sq. ft $7,500. A Holland Grove View Semi-detached. Narrow side garden and shorter car porch. Less than 3 years old in a neat subdivision of mainly semi-detached called Holland Grove View. Big basement which has the maid's room and 2 store rooms. A table tennis table can be installed. 2 bedrooms on 2nd floor and 2 bedrooms on 3rd floor. Jacuzzi bath and marble tiles in master bathroom. Snow white with greyish streaks in small living and dining area. Small playground for children. Jogging track by the canal. A hot Caucasian family area. Both fell in love with this California bright yellow walled 2-storey house. Brand new modern house with open concept kitchen and big patio at side for al fresco dining. Car porch for one car. Translucent plastic like awning outside living room brings in natural daylight. King's Drive, Kingsville 5+1 2,700/3,000 sq. ft $8,500. Less than 2 years old subdivision called Kingsville, mainly semi-detached. 3-storeys, cul de sac. This unit's back is fixed to the back of the neighbour, giving the impression it is a bungalow. Though it has 2 side gardens, these gardens are almost fully tiled by the Owner. Therefore, no green grass patch for the dog. Conclusion. For big garden, the Hua Guan bungalow was the favourite with the husband. Will the Owner rent for $7,000?